If the idea of Dorothy in Westeros sounds appealing to you, then NBC's miniseries Emerald City might be just the show for you. One of six Wizard Of Oz-themed projects currently in development for the small screen (including NBC's own live broadcast of the musical The Wiz), Emerald City is described as a Game Of Thrones-esque take on the classic novel, in which "20-year-old Dorothy Gale and her K9 police dog are transported to another world, one far removed from our own — a mystical land of competing kingdoms, lethal warriors, dark magic and a bloody battle for supremacy." In the first announced casting news for the project, Vincent D'Onofrio has joined Emerald City as the Wizard according to TV Line. NBC's take on the character is described as, "A man of science in a world of magic, he rules through inspiration, fear and a tenuous accord with the grand witches." And while the show's synopsis warns of "wicked witches [who] don't stay dead for long," there's reason to believe that the Wizard will turn out to be the true villain of Emerald City. Not only does he apparently rule through fear, but they've cast D'Onofrio to play him — an actor who has made a career out of playing menacing bad guys. Poor picked-on Pyle certainly wasn't a villain... but his descent into madness and his murderous psychotic break still scared the crap out of audiences in Stanley Kubrick's sobering war drama. D'Onofrio's memorably terrifying breakout role paved the way for plenty of future antagonists. D'Onofrio's first time playing the Big Bad in a movie is still one of his most memorable. As an alien bug who took over the skin of a farmer named Edgar, creeped us all out with his decaying skin and slurred speech patterns. Oh, and don't get me started on that gruesome transformation scene. That's pretty scarring stuff when you're a kid. Speaking of scarring stuff... Nobody makes a movie as visually sumptuous as director Tarsem Singh (The Fall, Immortals); but his feature film debut is as hard to watch as it is gorgeous to look at. In order to save a young woman, Jennifer Lopez's psychologist has to literally go inside the demented mind of a serial killer, played by D'Onofrio at his most devilish. But all of those villainous roles were simply to prepare D'Onofrio for playing his most indelible character to date: Daredevil's Wilson Fisk, the soft-spoken businessman who rules Hell's Kitchen with an iron fist. While a common complaint lobbied against the Marvel Cinematic Universe is its lack of compelling villains, D'Onofrio's Fisk is the exception that proves the rule. This summer, D'Onofrio took a break from playing in the M.C.U. 's sandbox to put in a supporting performance in the smash hit sequel Jurassic World. His character's evil plan — which involved using velociraptors to hunt terrorists in the mountains of Afghanistan — may have been completely ridiculous, but the actor gave it his all, chewing the scenery with gusto. And D'Onofrio doesn't look to be cutting down on the villainy anytime soon. Apart from his maybe-evil Wizard, he'll also star in 2016's The Magnificent Seven , a remake of the 1960 Western, alongside the likes of Denzel Washington, Matt Bomer, Ethan Hawke, Peter Sarsaard, and even his Jurassic World co-star Chris Pratt. Details about D'Onofrio's character have yet to be revealed, other than the fact that — shocker! — he'll be playing the movie's antagonist. 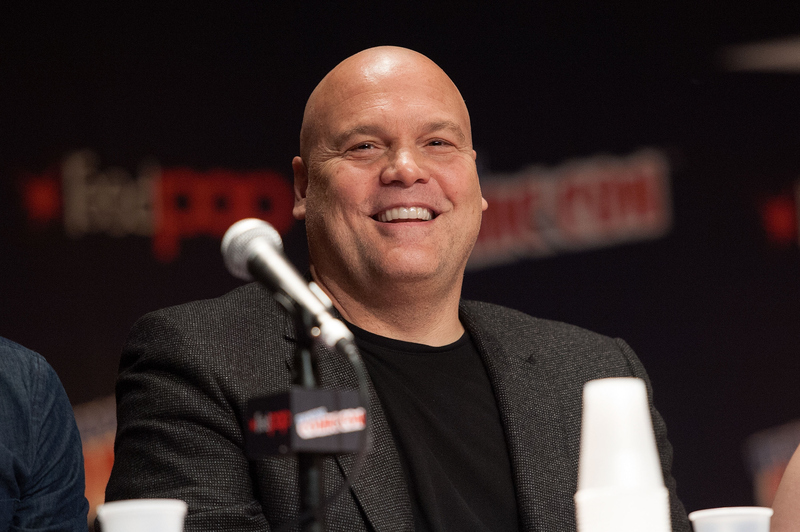 D'Onofrio will return as Wilson Fisk when Season 2 of Daredevil premieres on Netflix next year.